II) 40-year anniversary of the Birth of ELECTRIC SUN !! III) 50-year ANNIVERSARY of Uli’s first ever stage performance in 1968 !!! 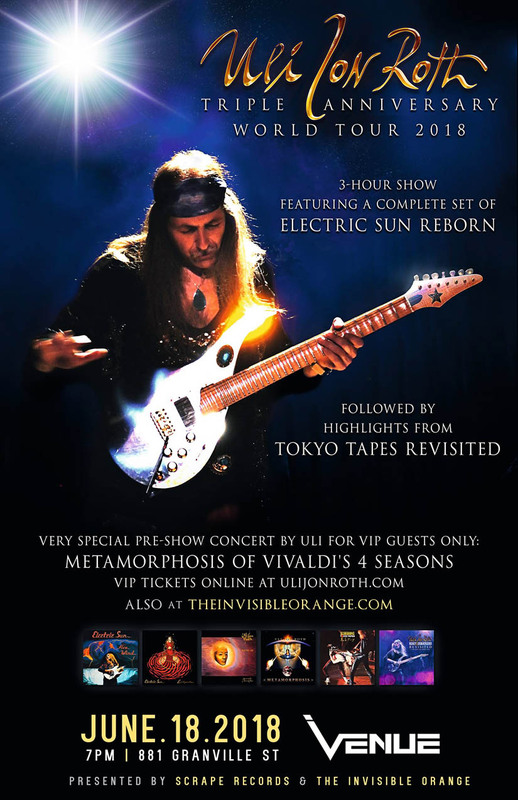 ULI JON ROTH is embarking on an epic TRIPLE ANNIVERSARY WORLD TOUR in the late Spring, starting with a two-month tour of the US and Canada! Central to the show is a 90-minute set celebrating the birth of Uli's legendary band, ELECTRIC SUN, 40 years ago. The Multi-media show will close with selected highlights from TOKYO TAPES REVISITED. As a very special treat Uli will also perform the complete METAMORPHOSIS OF THE FOUR SEASONS CONCERTO for VIP Guest ticket holders only. For Uli fans, it doesn't get any better than this !